November celebrations embrace Native American Heritage Month, national Native American Heritage Day, Veteran’s Day and the Combined Federal Campaign (CFC). 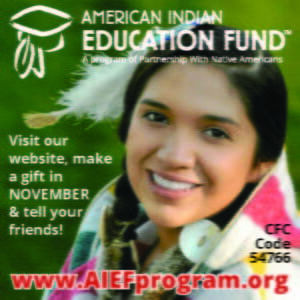 For federal and military employees pledging your CFC support for charities in the coming year, and others interested in Native education, what a great way to remember Native Americans. This month we’re recognizing Native American Heritage Month, and today we’re sharing this story on a Native American scholar assisted through the American Indian Education Fund (AIEF), a program of PWNA. Originally from Chinle, Arizona, Alison Watson is Navajo. She attended Northern Arizona University in Flagstaff, earning a B.S. in Biology, with minors in Chemistry and Anthropology. And today, Alison is pursuing her Ph.D. at University of Arizona. She shared that a little sibling rivalry to see who can get their master’s first keeps her going. When she can’t make it home to see family, she remembers education and passing it on to her people is worth it. PWNA applauds Alison Watson as a committed student and role model for Native American youth. For those of you participating in the Combined Federal Campaign, look for more on Alison and our AIEF video under CFC charity code 54766. This entry was posted in Humanitarian, Programs. Bookmark the permalink. Trackbacks are closed, but you can post a comment.